Nutrients applied to the skin are efficiently absorbed into the bloodstream. That is why we shouldn’t put anything on our skin that we don’t want coursing through our blood. And that is also why this homemade magnesium oil works so well: it’s a supplement we take through the skin. Actually, it’s not an oil. It feels slippery like oil, but it is a solution of magnesium chloride flakes in water. (I recommend Ancient Minerals magnesium flakes.) 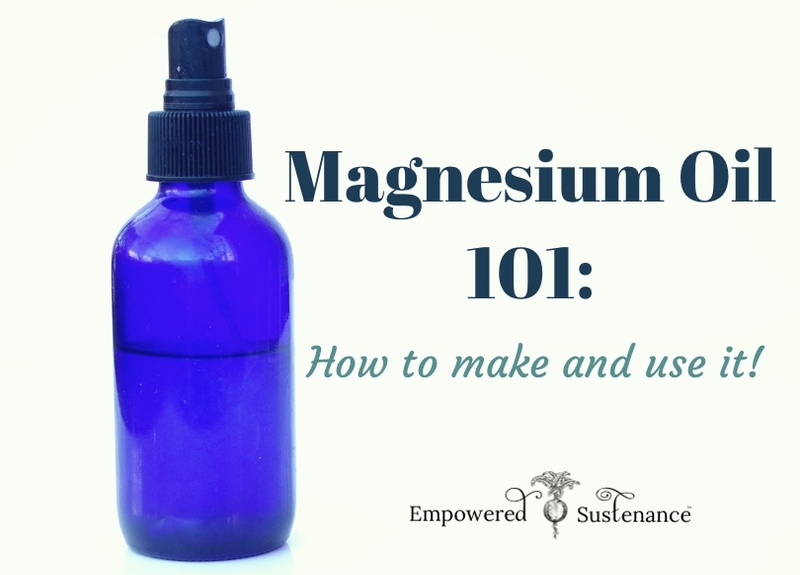 You can purchase magnesium oil, but making it yourself provides a WAY more economical option. It provides the benefits of magnesium supplementation in an absorbable form. Additionally, the body will only take what it needs through the skin. Whereas taking some supplements orally can cause an over-abundance in the body, this is not usually the case for transdermal therapy. Required for stable blood sugar and insulin sensitivity. Consumption of refined sugars deplete magnesium. Widely helpful for headaches and even migraines, according to Dr. Sircus. Many individuals have reported profound improvement in migraines when they use magnesium oil regularly. As an anti-stress agent in the body, it often promotes a sense of peace and wellbeing. It is very helpful in depression and anxiety. Bring the water to a boil in a non-aluminum saucepan. Turn off the heat and stir in the magnesium flakes until dissolved. When cool, pour into your spray bottle. No refrigeration is necessary. Spray it on to the body (details below) and lightly rub it in. It may still feel a bit greasy or moist on the skin. For me, it is fully absorbed without a residue within a few minutes. Use anywhere from 10-30 sprays per day. Many people say that the tingling will decrease over time, as your body becomes less deficient in the nutrient. This was definitely true for me, although it still feels slightly unpleasant for a few minutes after application. But the health benefits are totally worth it! Although it varies from person-to-person, there are general areas that are less sensitive to the magnesium oil and make better application sites. In my experience, areas with more adipose tissue (a.k.a. the plump areas) are less sensitive. Try the thighs, hips and belly. Shins and forearms also work well for me. Try to avoid the creases of the elbows, behind the knees, creases of the bottom, and the neck if you are experiencing tingling. These areas are usually more sensitive. Do NOT apply magnesium oil to your legs after shaving them – ouchie! I recommend waiting at least 12 hours before applying to shaved legs. If you experience no tingling when applying magnesium oil, you may be able to tolerate post-shave application. Dry brushing makes the skin more sensitive to magnesium oil. (Dry brushing is a practice to simulate the lymphatic system and improve skin tone). I dry brush in the evening, before my shower, and I find that applying the magnesium oil immediately post-shower creates intense tingling. So, I wait until the morning to apply magnesium oil, which gives my skin a period to “de-sensitize” from the dry brushing. You may notice a slight white film or powder on your skin after the magnesium oil dries. You can wipe or rinse this off, or briskly rub your skin and it will disappear. Wait at least 30 minutes before showering or bathing after applying magnesium oil, to ensure that the magnesium has absorbed into the skin and will not be rinsed off. Homemade magnesium oil makes a cheap and non-toxic deodorant! Again, if you experience any tingling with the oil on other body parts, do not apply it after shaving your pits. Get beachy waves by spritzing your damp hair very lightly with your magnesium oil. This doesn’t work for all hair types, but if you have a natural wave to your hair, magnesium oil can add volume and beachy texture. You’ll probably notice your hair looks like you just came back from an ocean dip. 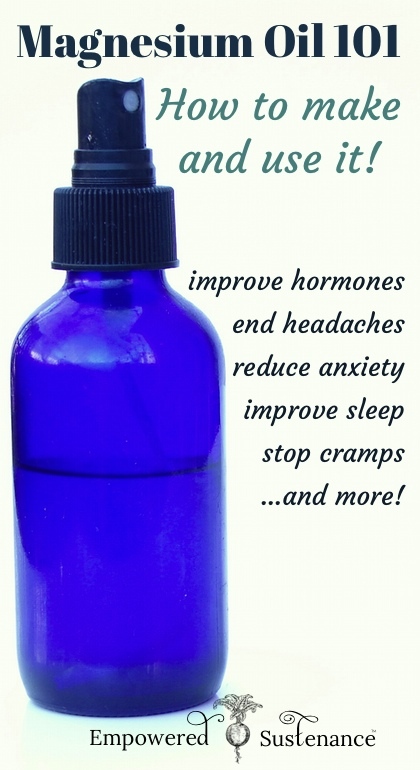 Take your bottle of magnesium oil with you to a massage. The masseuse can use then oil as a massage lotion and you will get a double whammy of relaxation from the magnesium and body work. Only do this if you are not having tingling after applying the oil or request that the oil only be massaged onto non-sensitive areas, such as the thighs. Dr. Sircus says that magnesium oil boosts healing after a sports injury. Applying it anywhere will support muscle healing, but you can also apply it to the area of a sore muscle. Muscle cramps? Immediately reach for your magnesium oil! Frequent muscle cramps will disappear as you use magnesium oil long-term and improve mineral balance with unrefined salt. But immediate application of magnesium oil can help instantly reduce a muscle cramp. I keep a small bottle of magnesium oil in my ballet bag, just in case I experience a calf or foot cramp. Add magnesium oil to your bath. However, it’s easier to just add the magnesium flakes directly into your bath instead of first making magnesium oil with it. Use the equivalent of 1/2 cup (or more) magnesium flakes per bath. Magnesium in the bath is absorbed into the skin and magnesium baths are deeply soothing and relaxing before bed. Do you use magnesium oil? Have you noticed a difference after using it? can I use magnesium oil every day up to what period?